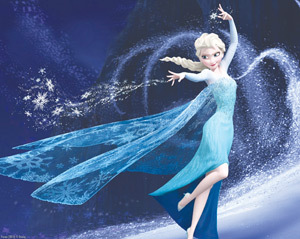 Frozen is an animated musical fantasy inspired by The Snow Queen by Hans Christian Andersen. It tells the story of a princess Anna (Kristen Bell) who sets off to find her sister Elsa (Idina Menzel) who has icy powers and has trapped the kingdom in eternal winter. On her way Anna meets an iceman, Kristoff (Jonathan Groff), his pet reindeer and snowman Olaf (Josh Bad), who help her on her journey of finding her estranged sister Elsa. The four of them go on an adventure that is dangerous, exciting, dramatic and funny before they find Elsa, who refuses at first to go home, but eventually after a lot of drama she goes home, she learns to distinguish between real love and pretended love, the ice spell is broken and everybody lives happily ever after. Initially I was skeptical about watching this film because it is an animation. Definately I thought I am to old to watch animated films, but what a lovely surprise Frozen turned out to be. The special effects are brilliant and the characters almost seem real, plus the script is elegant and well-written. It gave me the feeling of not wanting to blink so that I do not miss a moment and even though most of the digital special effects have already been used in other films, Frozen seemed more genuine. The fact that it is also a musical gave me a warm and fuzzy feeling and the break-outs in song are just at the right time, making this film even more magnificent. Everything is just so in-sync and fits together well. My favorite character is Olaf the snowman who is hilarious and just oblivious of what is going on around him and …..
he is happy with it. Adult viewers must please not copy my defiance thinking they are too old for animations. Before I watched Frozen I had no idea what a tremendous impact it would have on me. Do not think this is just for children. I advise grown-ups to make a point of seeing Frozen. You will enjoy it and relearn the lessons you were taught by your parents as well as by life itself. And you will finally figure out what it is about the songs in this movie that make children the world over sing along. I recommend Frozen to the young, the old, the single and the married. David Keyes of Cinemaphile.org wrote this about Frozen, Funny, whimsical and delightful to a fault, it is one of those movies that engages minds of all ages, much in the same way that “Beauty and the Beast” and “Sleeping Beauty” did for their respective generations. And this notion comes, ironically enough, as a bit of a surprise Frozen has won two Academy Awards for Best Animated Feature and Best Original Song and the Golden Globe Award for Best Animated Feature Film and a BAFTA Award for Best Animated Film.